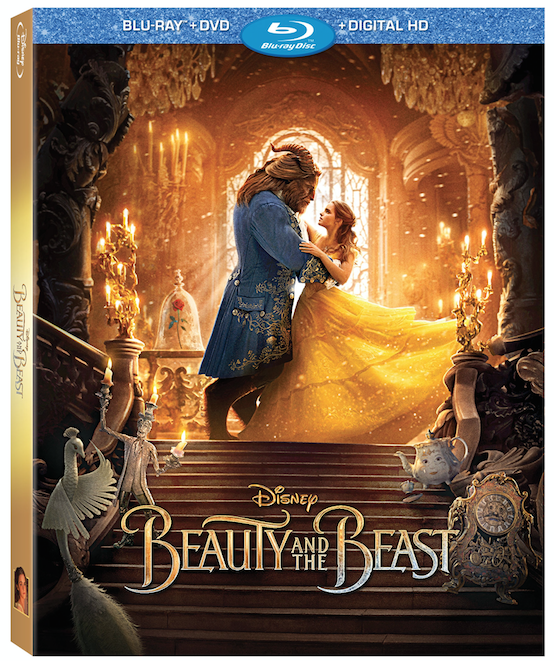 The new Beauty and the Beast, available now on Blu-Ray and DVD, is an absolutely mesmerizing masterpiece that belongs in your home viewing collection. Fans who bring home “Beauty and the Beast” can celebrate the release with three ways to watch the movie – the original theatrical cut, the premiere cut with overture, and a musical experience with a sing-along version. The release invites viewers to get up close and personal with the filmmakers and cast to see how this beloved animated film was transformed into a new live-action classic, from the first enchanted table read to a fascinating look at how the film was brought to life utilizing lavish sets, elaborately designed costumes and props, and state-of the-art technology. A feature on the amazing women behind the enchanted tale hosted by Emma Watson; and over 10 minutes of deleted scenes along with musical extras, including the “Beauty and the Beast” music video starring Ariana Grande and John Legend, Celine Dion’s heartfelt take on the new song “How Does a Moment Last Forever,” and jump directly to all you favorite unforgettable songs. The basic storyline for Disney’s Beauty and the Beast has not been changed. It’s re-enactment using real people gives the entire movie a depth it did not have before. Answers to questions we never thought to ask as kids can be answered. What happened to Belle’s mother? Why was the Beast such an atrocious young man? What possessed LeFou to be such a blind follower of Gaston? There are other layers that have been added to the story that update it and bring some important discussion points. Belle repeatedly refuses Gaston’s advances, something he does not even seem to be able to comprehend. And she appears to be one of the few people in the entire village who can read and clearly the only woman. Even her inventions are scorned and feared with a Luddite-like ferocity. Beauty and the Beast has been beautifully re-created in a way that encourages the entire family to enjoy and discuss some very important ideas. The folks over at Disney are offering one of my very lucky Canadian readers a copy of this beautiful production. Enter using the Rafflecopter form below. Odds of winning will depend on the number of eligible entries received. Not responsible for lost or misdirected entries. Contest closes June 24, 2017 11:59 pm ET Good luck everybody! 35 Responses to "Beauty and the Beast Review & Giveaway"
My whole family loves this movie. It's actually the first version of Beauty and the Beast that I've seen! I will watch this with my kids! I'm watching it all on my own. in peace and quiet. I will watch it with my grandchildren. I would watch this with my daughter. She has been asking me to take her since it came out. I will watch with my daughter. I will watch this with my grandchildren. I would love to watch it will my grandkids! I will watch this with my 4 year old daughter. I'll watch Beauty and the Beast with Miss R.
I would watch Beauty and the Beast with my niece's. I will watch this with my little grandson. I will watch this with my niece if I was lucky enough to win. I will watch this with my sister. I'd watch this with my kids. I will watch this with the kids! I would watch this movie with my bestie.. She is a die hard Beauty and Beast Fan. I will watch this with my daughter, Becca. I'll watch this with my little granddaughter. I want to watch this with my dad. He took me to see the cartoon version when I was a kid and I think it would be nice to get togehter to watch this one, too. Looking forward to watch it with my friend. I'll watch with my daughter, Belle is her favorite Princess.